Pu'u Kalepeamoa, or Sunset Hill, is a cinder cone near the Mauna Kea Visitor Information Station (MKVIS) that serves up big views of the Saddle Road region and can provide incredible sunset views looking west toward the Kona coast. It's possible to just hike up to Pu'u Kalepeamoa and back to the MKVIS for a nice, short outing, but we present a longer loop hike that allows you to visit the area around the MKVIS. If they are blooming, you can also visit the ʻāhinahina (Silversword) Enclosure near the parking lot to round out a nice day. Trailhead: From either side of the island, take the Saddle Road, Hwy. 200, to the Mauna Kea road near the 28 mile marker. The road is well-marked. From the turn, follow the paved road for six miles to the Ellison Onizuka Mauna Kea Visitor Information Station (MKVIS). Park here, this is the trailhead. 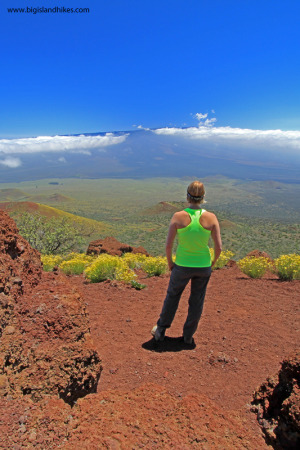 Gear: This hike is located high on the flanks of Mauna Kea near 9000' above sea level, so expect temperatures lower than almost everywhere else on the island and extreme weather. Bring winter gear, sturdy boots, and plenty of extra food and water. Hike: The hike described below travels a loop in a clockwise direction, but you could reverse it to finish at Pu'u Kalepeamoa instead of starting with it. From the MKVIS, cross the Mauna Kea Road and hike down it for a very short distance and locate an old dirt road traveling to the southwest. Hike 0.25 mile on this road toward a power transfer station and find the trail to Pu'u Kalepeamoa. Hike another 0.25 miles to gain the summit. Enjoy the incredible views of the Saddle Road region. If you're just doing Pu'u Kalepeamoa, return the way you came. If you're doing the longer loop, return back to the intersection with the road and then hike west past the power transfer station. You'll quickly lose some altitude as you hike down to a broad valley between a few old cinder cones. The old road/trail then cuts northwest around Pu'u Haiwahine. After 0.6 mile, reach an intersection and hike west. After hiking up a short rise, you'll find a spur trail that heads south back toward Pu'u Haiwahine. This spur trail ends abruptly, but offers views into the old cinder cone. Return back to the main trail and again head west. You'll eventually find a sign that indicates the end of the trail due to hazardous conditions beyond. 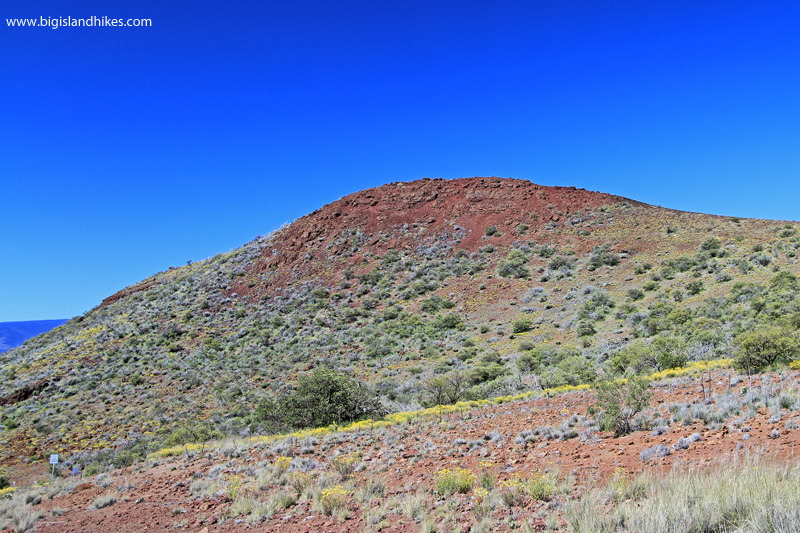 Here, you'll have a great vantage on Waikahalulu Gulch, a major dry drainage on this part of Mauna Kea. Enjoy the view of the Gulch and return the way you came. When you reach the intersection in the broad valley between the old cinder cones, hike east instead of the southern direction from which you came. Climb east around the northern side of Pu'u Kilohana. After passing the high point, you'll find the intersection of the Humu'ula Trail heading to the top of Mauna Kea. Pass this intersection and continue east back to the Mauna Kea Road. Once you reach the road, hike a short distance back down to the MKVIS where you parked earlier. If they are blooming, you should visit the ʻāhinahina (Silversword) Enclosure at the opposite end of the parking lot.